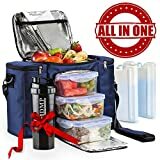 YOUR ALL-IN-ONE MEAL PREP KIT: Includes everything you’ll ever need for fuss-free portion control: roomy lunch bag; 3 dishwasher-safe food containers; 2 ice packs for extra chill + 22-oz. shaker. LEAKPROOF 45-OZ. CONTAINERS: Unlike most meal-prep sets, this one includes 3 reusable containers, each 6.3″ x 6.3″ x 3″ (big enough to hold a complete meal). Locking lids prevent leaking. Won’t stain. 100% LIFETIME GUARANTEE: From its strong, padded strap to its reinforced bottom, your My Daily Meal Plan Set is built to last. But if you’re ever unhappy, just return it for a money-back refund.